(Francisco Kjolseth | The Salt Lake Tribune) Activists are removed from a building where they staged a protest against a private prison company with contracts to hold undocumented immigrants on Thursday, July 12, 2018, at the headquarters of Management and Training Corporation in Centerville. (Francisco Kjolseth | The Salt Lake Tribune) Police close off access to where activists stage a protest against a private prison company with contracts to hold undocumented immigrants on Thursday, July 12, 2018, at the headquarters of Management and Training Corporation in Centerville. 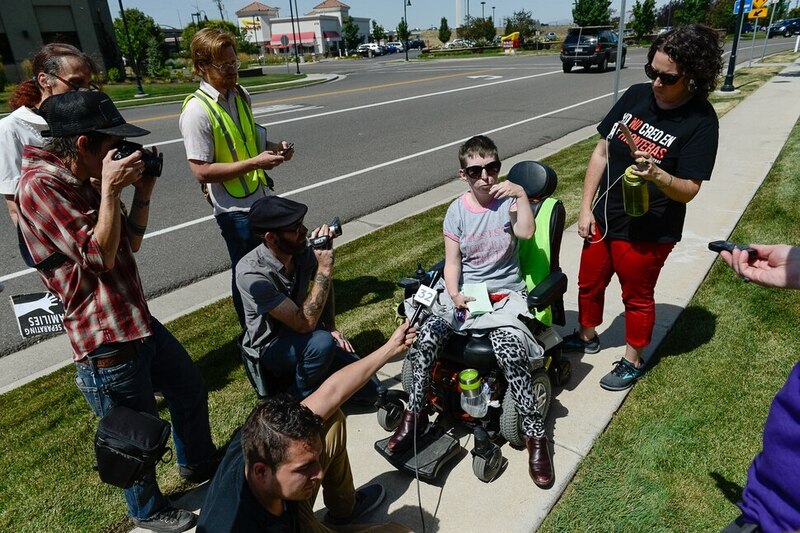 (Francisco Kjolseth | The Salt Lake Tribune) Activists Psarah Johnson talks about locking herself alongside other activists in the lobby of a private prison company with contracts to hold undocumented immigrants on Thursday, July 12, 2018, at the headquarters of Management and Training Corporation in Centerville. Johnson was released after being charged with disorderly conduct, trespassing and resisting arrest and believes she was let go while others were arrested because the police is not ADA compliant. 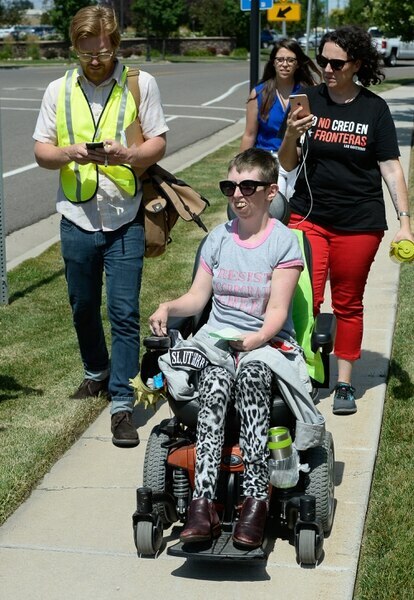 (Francisco Kjolseth | The Salt Lake Tribune) Activists Psarah Johnson talks about locking herself alongside other activists in the lobby of a private prison company with contracts to hold undocumented immigrants on Thursday, July 12, 2018, at the headquarters of Management and Training Corporation in Centerville. Johnson was released after being charged with disorderly conduct, trespassing and resisting arrest and believes she was let go while others were arrested because the police is not ADA compliant. (Francisco Kjolseth | The Salt Lake Tribune) Activists are removed from a building where they staged a protest against a private prison company with contracts to hold undocumented immigrants on Thursday, July 12, 2018, at the headquarters of Management and Training Corporation in Centerville. (Francisco Kjolseth | The Salt Lake Tribune) Law enforcement leaves the building where activists staged a protest against a private prison company with contracts to hold undocumented immigrants on Thursday, July 12, 2018, at the headquarters of Management and Training Corporation in Centerville. (Francisco Kjolseth | The Salt Lake Tribune) Activists stage a protest against a private prison company with contracts to hold undocumented immigrants on Thursday, July 12, 2018, after locking themselves in the lobby at the headquarters of Management and Training Corporation in Centerville. (Francisco Kjolseth | The Salt Lake Tribune) Police gather evidence, including arm lock tubes with the words ABOLISH ICE after activists staged a protest against a private prison company with contracts to hold undocumented immigrants on Thursday, July 12, 2018, at the headquarters of Management and Training Corporation in Centerville. (Francisco Kjolseth | The Salt Lake Tribune) Activists stage a protest against a private prison company with contracts to hold undocumented immigrants on Thursday, July 12, 2018, at the headquarters of Management and Training Corporation in Centerville. (Francisco Kjolseth | The Salt Lake Tribune) Activists stage a protest against a private prison company with contracts to hold undocumented immigrants on Thursday, July 12, 2018, at the headquarters of Management and Training Corporation in Centerville. (Francisco Kjolseth | The Salt Lake Tribune) Activists stage a protest against a private prison company with contracts to hold undocumented immigrants on Thursday, July 12, 2018, after locking themselves in the lobby at the headquarters of Management and Training Corporation in Centerville. (Francisco Kjolseth | The Salt Lake Tribune) Police gather at the scene where activists staged a protest against a private prison company with contracts to hold undocumented immigrants on Thursday, July 12, 2018, at the headquarters of Management and Training Corporation in Centerville. (Francisco Kjolseth | The Salt Lake Tribune) Police gather outside where activists stage a protest against a private prison company with contracts to hold undocumented immigrants on Thursday, July 12, 2018, after locking themselves in the lobby at the headquarters of Management and Training Corporation in Centerville. 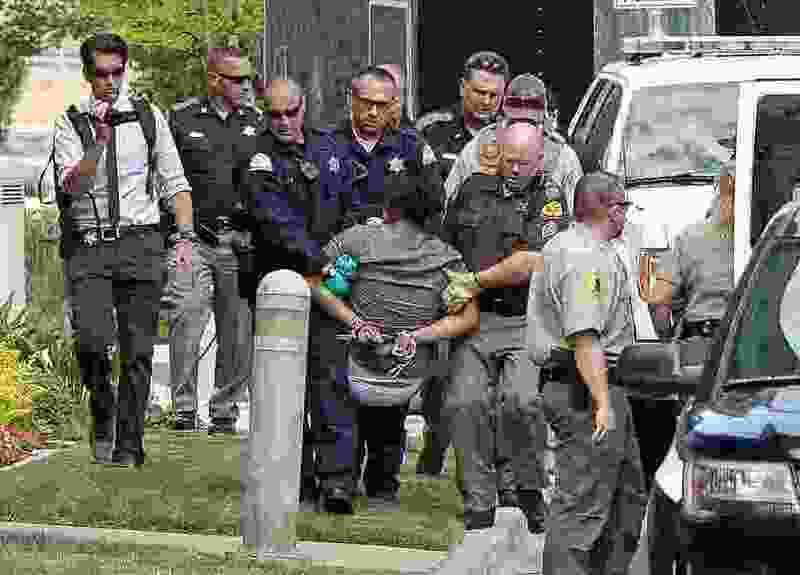 (Francisco Kjolseth | The Salt Lake Tribune) Police gather evidence, including arm lock tubes with the words ABOLISH ICE after activists staged a protest against a private prison company with contracts to hold undocumented immigrants on Thursday, July 12, 2018, at the headquarters of Management and Training Corporation in Centerville. (Francisco Kjolseth | The Salt Lake Tribune) Activists are removed from a building where they staged a protest against a private prison company with contracts to hold undocumented immigrants on Thursday, July 12, 2018, at the headquarters of Management and Training Corporation in Centerville. (Francisco Kjolseth | The Salt Lake Tribune) Activists are escorted out of a building where they staged a protest against a private prison company with contracts to hold undocumented immigrants on Thursday, July 12, 2018, at the headquarters of Management and Training Corporation in Centerville. (Francisco Kjolseth | The Salt Lake Tribune) Activists stage a protest against a private prison company with contracts to hold undocumented immigrants on Thursday, July 12, 2018, after locking themselves in the lobby at the headquarters of Management and Training Corporation in Centerville. (Francisco Kjolseth | The Salt Lake Tribune) Activists are escorted out of a building where they staged a protest against a private prison company with contracts to hold undocumented immigrants on Thursday, July 12, 2018, at the headquarters of Management and Training Corporation in Centerville. (Francisco Kjolseth | The Salt Lake Tribune) Activist Lesley Ann Shaw is removed from a building where activists staged a protest against a private prison company with contracts to hold undocumented immigrants on Thursday, July 12, 2018, at the headquarters of Management and Training Corporation in Centerville. (Francisco Kjolseth | The Salt Lake Tribune) Activists stage a protest against a private prison company with contracts to hold undocumented immigrants on Thursday, July 12, 2018, after locking themselves in the lobby at the headquarters of Management and Training Corporation in Centerville. (Francisco Kjolseth | The Salt Lake Tribune) Activists are removed from a building where they staged a protest against a private prison company with contracts to hold undocumented immigrants on Thursday, July 12, 2018, at the headquarters of Management and Training Corporation in Centerville. (Francisco Kjolseth | The Salt Lake Tribune) Law enforcement covers up the windows where ctivists staged a protest against a private prison company with contracts to hold undocumented immigrants on Thursday, July 12, 2018, after locking themselves in the lobby at the headquarters of Management and Training Corporation in Centerville. 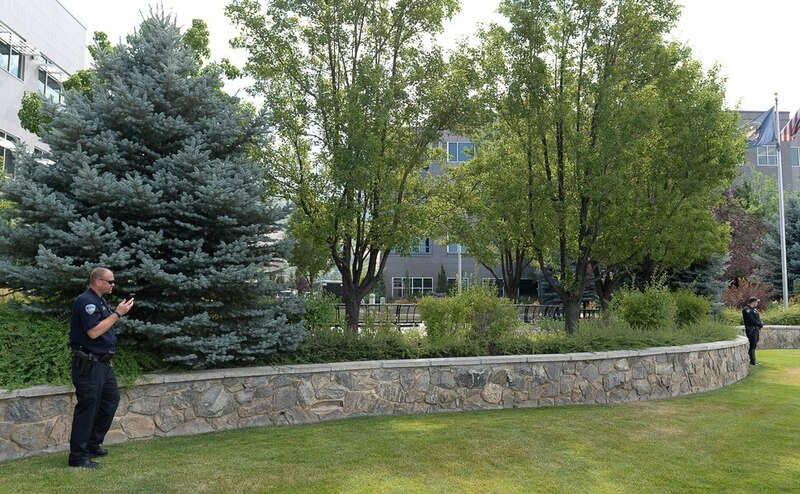 Centerville • Police arrested eight protesters who disrupted the offices of a Utah-based business that operates immigrant detention centers, demanding Management and Training Corporation withdraw from its contracts with the federal government immediately. About 25 protesters entered the building at Marketplace Business Park at 500 North and 400 West at 7:45 a.m. Thursday, some chaining themselves to the structure and to each other. The property owner called Centerville police, who arrived and told the protesters to leave. About 15 of them did. Protesters who remained were arrested on suspicion of trespassing, disorderly conduct and resisting arrest, according to Centerville police. Taylor Goldstein, the group’s designated spokesperson, said before the arrests that the protestors felt a moral responsibility to act. The Trump administration’s “zero-tolerance” policy became a flashpoint nationally because it mandated that adults caught illegally crossing the border be subject to criminal prosecution and separated from their children, who are placed in different facilities. “They really did want to come to an agreement. They gave us many chances to leave of our own volition,” she said, adding the protesters intended to be arrested. “And the reason we were all willing to do this is what we were seeing, so many families being taken away from their children; we’re seeing children being put into detention centers,” she said. On its website, MTC said its facilities provide adult detainees access to medical and legal resources and voluntary recreation and other activities. Robinson said the group did not do anything violent. “They’ve been intimidating people as they come in and out of the building,” he said before the arrests. “But they have not put their hands on anybody." The protesters were on the first and second floor of the building; workers in the upper floors were told to “shelter in place” to “keep everybody separated," Robinson said. Goldstein read a statement that said MTC, headquartered in Centerville and owned by Utahns Scott and Jane Marquardt, is the third-largest private prison company in the United States. It has proposed opening a new immigrant detention facility in Evanston, Wyo., she added. The group is demanding that MTC drop its plans for the Evanston facility; stop profitting from private prisons; and support decriminalizing immigrants. Much of the group’s anger is focused on the owners of MTC. Goldstein said the protesters banded together after the recent Family Belongs Together rally in Salt Lake City and had been discussing the protest for several weeks. “We don't have a name. We're just a group of concerned community members,” she said. “We just couldn't take it anymore. We felt that we had to do something. “I’m Mexican-American and Jewish, and that’s why this is important to me,” said Goldstein, 26, who lives in Salt Lake City. Officers from the Bountiful, North Salt Lake, Farmingston, Woods Cross and West Bountiful police departments, in addition to the Davis County Sheriff’s Office and Utah Highway Patrol, responded to the protest, according to a news release.